Day two of our Nanaimo blueberry roadtrip began after a decent nights’ sleep despite the never ending squawking of seagulls. Janet was nice and bright and looking forward to the day. The blueberry farm is south of Nanaimo in an area called Yellowpoint and is home to some of the oldest blueberry bushes in the province. We arrived around 10:30 and got right to work. Our family friends, Wendy, Tove and Neils Nielsen were recruited by my mom to help us out. 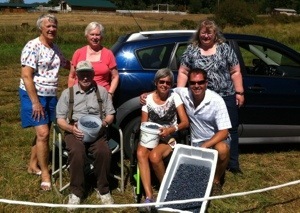 Good thing too, as by noon we (they) had picked 47.5 pounds of blueberries! 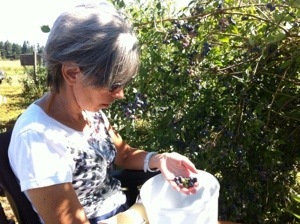 Janet did a great job picking, getting nearly a bucketful in the time we were there. She had a little trouble in the quality control department and surprisingly I had to remind her occasionally she was allowed to eat a few as she picked. Overall I think it was a great experience for Janet as no one was watching over her shoulder while she did something. She was on her own with me checking for quality and quantity once in a while. The group decided to go for lunch at Cherry Point Estate Wines, a winery in Cobble Hill. It was well worth the drive as we enjoyed a nice meal, conversation and sunshine together. Can’t say I’d recommend the wine we had with lunch (Pinot Gris) but their Sparkling Rose was quite good. The food was good and very nicely presented. 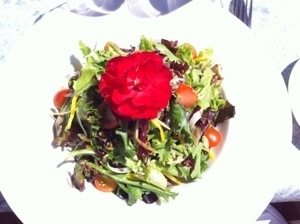 This was Janet’s salad and yes the flower is edible. After being out in the sun most of the day, Janet welcomed a little rest time when we got back to mom’s. that recharged her for a long walk around the neighborhood where we saw up close, two young eagles and two bunny rabbits along with lots of very expensive motor yachts from the USA. Janet and I tried to convince mom to go for dinner on the docks where we’ve heard the fish tacos are amazing but seniority ruled and we enjoyed a nice home cooked meal. My cousin Brent and his partner Kaj dropped in for a visit all the way from Port Alberni. Super nice to see them and we were reminded of how good the Alberni crew is. Hope to see the rest of you soon. Tomorrow is sail away day and the drive back to Kelowna to start freezing blueberries. Praying for a solid rest tonight and a safe, enjoyable journey home.